Sleeve bearings fans have a well-deserved reputation of wearing out quickly. But they’re inexpensive, and not necessarily cheaply made. They can perform very well indeed. We want to use them on our heatsinks, but we worry that they will fail and leave our CPU’s overheating. Wouldn’t you like to be able to use a sleeve bearing fan and not have to worry? Read on. If you peel back the label and pop the cap of sleeve bearing fans you will find many have lubrication wells that are dry as the proverbial bone. In other words, no matter how well-designed the fan, if it is assembled without enough oil, its life will be shortened. And it might not perform as well as it should. 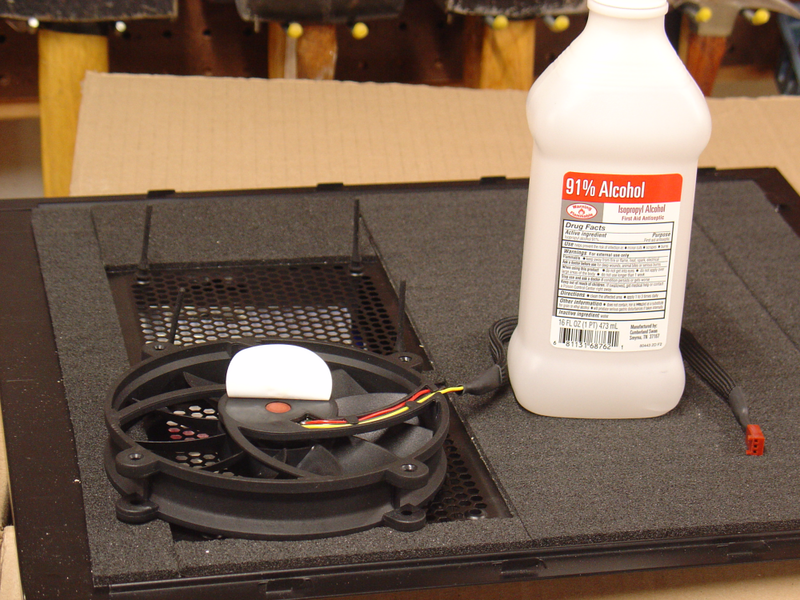 In one case I sped up a fan by 15%, just by putting a couple drops of oil in it. That turned out to be a crucial increase, because the fan went from essentially useless to pushing a fair amount of air. And that fan will last a lot longer with oil in its well than if it had run with a dry bearing. I would recommend lubricating every fan that has a well you can get to — that includes any ball bearing fan — before putting it in service. For sleeve bearing fans you should inspect their lubricant wells every six months or so, and top up those that need it. It’s a lot like changing the oil in your car. Preventative maintenance. 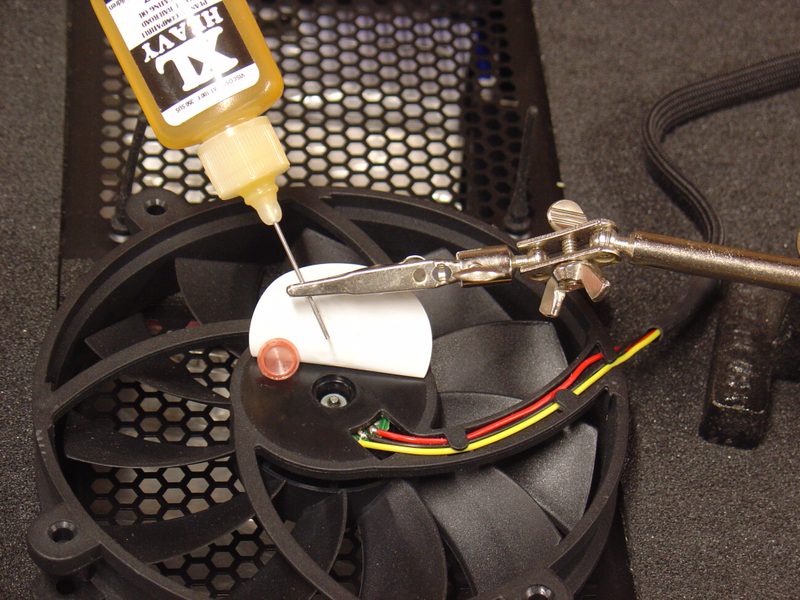 So, how do you lubricate a fan? 1. Gather your materials. Any machine oil will do. If you are oiling a ball bearing fan, a light oil would penetrate through tight clearances, but in a sleeve bearing fan you may want a heavier oil that will tend to cling to surfaces. Probably the best compromise is Singer sewing machine oil, available at Wal-Mart and other places for under $3.00. I have used a number of oils. No problems with any so far. You might even want to dip a little from a can of car oil. According to some who have tried it, it does work. 2. Peel back the label. Most sleeve bearing fans have a little cap that holds in the oil. 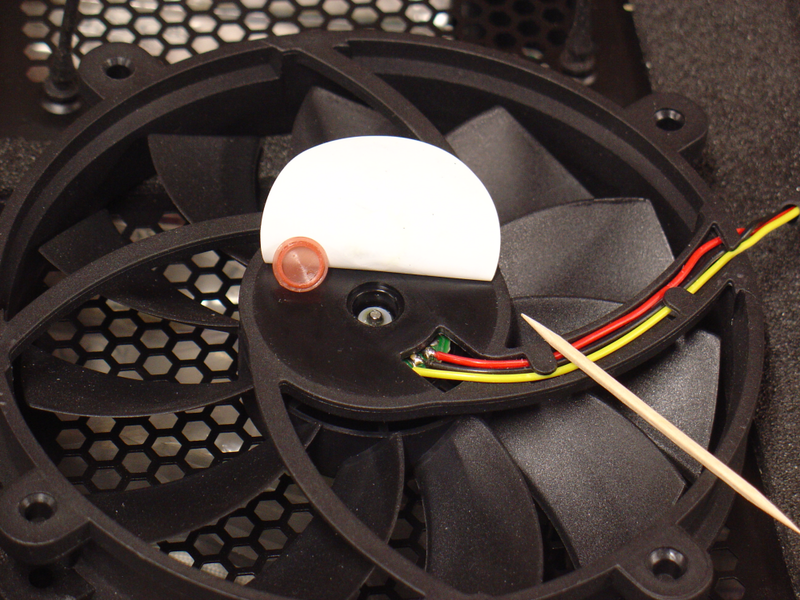 Ball bearing fans tend not to have a cap. They seem to believe their bearings are sealed. Maybe so, but you can watch a low viscosity oil seep in. That’s not really sealed, is it? But there are fans with hard plastic well covers that are glued tight. Let those be. 3. Pop the cap. I use a toothpick because it is wood, and less likely to damage the cap. But any pointy tool will do. Just go easy. BTW — that well looks dry, doesn’t it. Good thing I opened the cap. 4. Put in the oil. Don’t overfill, or you will squirt out oil when you put the cap back on. 5. Put the cap back on. Now clean around it if any oil spilled. Rubbing alcohol will do — the higher the alcohol content the better. Acetone will do as well. I suppose even soap and water. You just want the label to stick again when you are done. 6. Reseal the label and re-mount the fan. Be sure to check again in a few months. 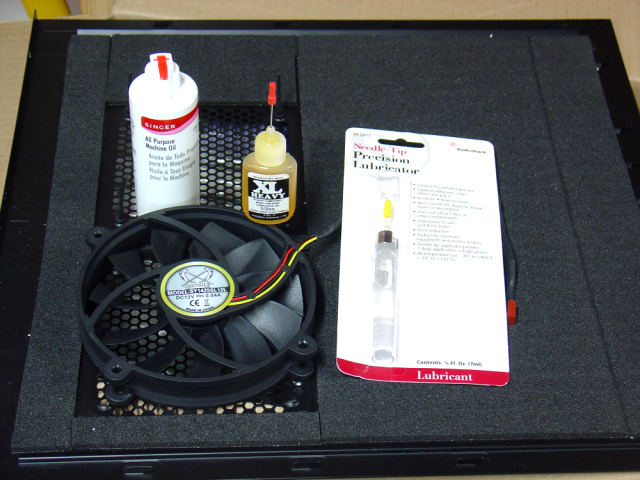 Lubricate every fan that can be lubricated before you install it, and re-lubricate it just as you would your car: with proper treatment a sleeve bearing fan might last a long time. And a ball bearing fan will run more quietly. I showed you how. It’s quick and easy. Do it and you’ll be happy you did. o.O Sweet, thanks for the info. I just bought a Haf-x case and ive noticed one of the large fans makes noise when i turn on the machine now, tho it does go away after about 5-10 minuets. Perhaps this is what it needs. Only question is, if you didnt know what the fan was at purchase (the type) how can you tell by looking at it? I lubed all my fans when I received my new case, I had the h70 which was being replaced but I wanted to use the fans and one of them was making a slight squeaking sound so I gave it 3 drops of 3 in 1 oil and did that to the other 3 120mm fans as well as 7 140mm fans that haven't even been used it, I have no doubt it makes a brand new quiet fan even quieter and you don't have to worry about fans locking up on you especially fans that aren't visible. I recommend against 3-in-one oil. It contains a penetrant. Figures, thats what i went out and got for this purpose. Whats the penetrant? My local stores dont have "sewing machine" oil. I'm surprised you can't find Singer machine oil in a fabric shop or department store. I found mine at Wal-Mart. But you can use any oil oil. A penetrant is like WD-40 -- designed to penetrate stuck stuff and loosen rust or other gunk that keeps bolts from turning, etc. Thanks for providing this info on lubricating fans. I found it very helpful. great tip....i'll have to bring home my air tool oil and oil up the yate loons i got. been using them for some time now so they are probably due for some oil. Interesting bit of info here. Thanks Ehume! Thanks for the great tip. I forgot I had some good gun oil laying around never would have thought. I tried an older case fan a 92mm as a test with this oil. Wow what a difference sounds better seems to move quicker to..lol maybe its just me & the placebo effect. What do you do if you can't get the sticker off the fan. Is there a recommended sticker removal method? I have used a razor blade on tough cases. But then I have a box of single sided razor blades. Sometimes a heat gun will help; but a plastic label will shrink when heat is applied. Make sure you have a sleeve bearing or ball bearing fan. No sense in destroying a label only to find you can't get into the lubricant well. I used the wife's blow dryer on high if you don't have a heat gun. Is mineral oil an acceptable oil? It's all I have without shopping for additional oils.. I want to re-lube the fans on my GTX 580 DCUII (ASUS). 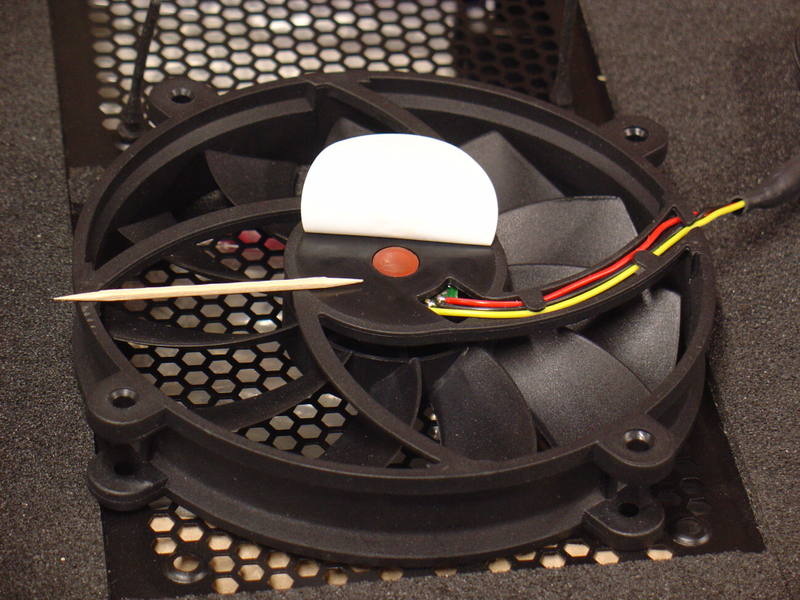 Anyone familiar knows there are 3 holes on the non-sticker part of the fan. Are those fill holes? 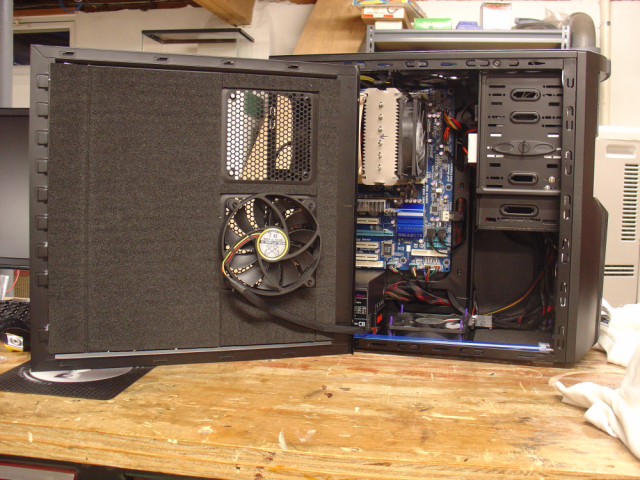 Or do I have to take it apart and get to the back of the fans? You could write to the manufacturer/seller of your video card and ask about the fan -- does it have a sleeve bearing or what? As for mineral oil, there is a Wikipedia page. I've not tried it myself, but I don't see why it wouldn't work. OTOH, you could always wait until you have some oil. On the gripping hand, I know that OCFers hate to wait. I know I do. Well, I mean if I get in there and there's no lube well I find out at that point which type of bearing I have right?